Scholar. Physician. Astronomer. Philosopher. Leader. 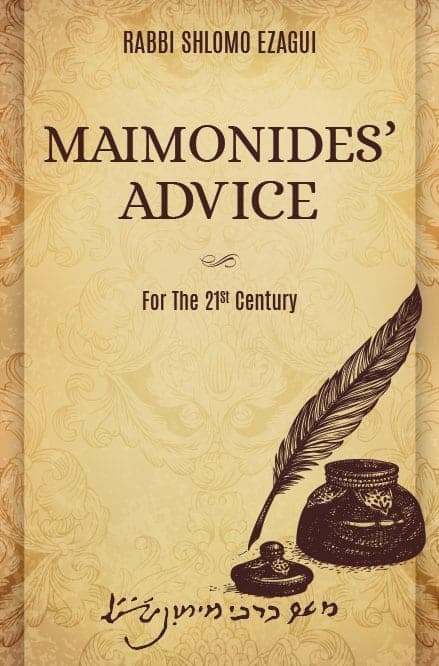 It is difficult for us to fathom the greatness of Maimonides, Rabbi Moshe ben Maimon (Rambam). His many works are studied daily around the world, eight hundred years after he wrote them, and are considered pillars of Jewish Law – and thought. Indeed, the author of the Shulchan Aruch (Code of Jewish Law), Rabbi Yosef Karo wrote, “The Rambam is the greatest of the decisors, and all the communities of the Land of Israel and the Arabistan and the Maghreb practice according to his word, and accepted him as their rabbi.” His teachings are timeless. The Rambam’s teachings are for everyone, and apply to everyday life. In this fascinating collection by noted educator Rabbi Shlomo Ezagui, readers get the Rambam’s advice for life – in his own words.